VALLEY CENTER, CA--(Marketwire - January 25, 2011) - Professional football player Michael Vick will not receive an invitation to the Annual Conference of the National Animal Supplement Council (NASC), however, Jim Gorant, the voice of the dogs that were rescued from Vick's dog fighting operation, will share their amazing story of victory in a keynote address on May 11. A Sports Illustrated (SI) writer, Gorant uncovered the true story behind what became of Vick's pit bulls once they were seized from the athlete's Bad Newz Kennels by government officials following the raid of his dog fighting operation. Gorant's ensuing cover story in SI's December 2008 issue generated more than 475 letters and emails from readers, the most any single story received in the past three years. The outcry from readers inspired Gorant to capture the full story in his newly released book, The Lost Dogs (Gotham, 2010). "If you're a dog and People for the Ethical Treatment of Animals (PETA) and The Humane Society of the U.S. suggest you be put down, you've got problems," Gorant wrote in his SI story. He then spent a year investigating and interviewing the team of experts across the country who worked as advocates for the dogs and their rehabilitation. 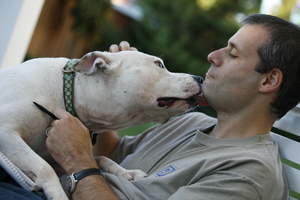 "Fighting dogs, especially pit bulls, are almost always considered beyond help and euthanized. So this was a landmark legal decision to allow a team of experts to come in and attempt to restore the unimaginable damage inflicted upon these dogs." The rehabilitation of Vick's dogs was kept secret at first, even though his trial gained national attention, in order to protect the dogs from thieves of the dog fighting underworld. Gorant's book details the behind-the-scenes stories of Vick's surviving dogs and the influence, resilience, dedication and commitment of the animal behavior experts, animal-care groups, lawyers and government officials that united to save them. "I didn't interview Michael Vick for this book because to me the story was more about what happened afterwards, which was an amazing thing," says Gorant. "At the very core of the story is the human-animal bond that affects and inspires us all." Gorant will kick-off NASC's Annual Conference with the story of The Lost Dogs, on May 11 at 5 p.m., at Town and Country Resort and Convention Center in San Diego. The conference is exclusive to NASC members and both state and federal regulatory officials, however invited guests of NASC members can attend Gorant's opening keynote for $50. A cocktail reception with the author will follow. "Jim Gorant's story exemplifies what our organization is all about; coming together as a compassionate advocate for the safety, health and wellbeing of our companion animals," says Bill Bookout, president of NASC, the nonprofit industry trade association leading the charge for national regulation of supplements for companion animals and horses. National Animal Supplement Council works on the behalf of concerned and committed providers of animal health supplements, supply chain partners and state, federal and international government officials to create a regulatory environment that provides a framework that is fair, reasonable, responsible and nationally consistent to protect and enhance the integrity of the animal health product industry. For more information on NASC visit: www.animalsupplements.org; or The Lost Dogs: www.thelostdogsbook.com.